PHOENIX — The Arizona Game and Fish Department has posted the 2018-19 Arizona Dove and Band-tailed Pigeon Regulations online at http://www.azgfd.com/Hunting/Regulations. The regulations have been produced in a format that hunters will find particularly handy in the field. The color brochure is easier to read and features important hunting information, such as season dates, daily bag and possession limits, and legal requirements, at a glance. Hunters 18 and older must possess a valid Arizona hunting license, as well as a migratory bird stamp for the 2018-19 season — both of which can be purchased online now at https://license.azgfd.gov/home.xhtml. For everything else “dove,” visit www.azgfd.gov/dove. 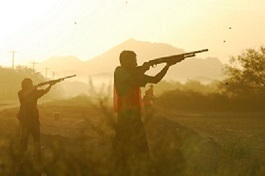 Dove hunters play an important role in conservation. Wildlife and Sport Fish Restoration Program (WSFR) funds are comprised of excise taxes collected on the sale of hunting and fishing equipment (including 11 percent on ammunition), the benefit of which comes right back to Arizona for habitat improvements, shooting ranges, boating access and more. Don’t just buy a hunting or a fishing license. Go online today and purchase a combo hunt and fish license that will be valid for the next 365 days — and for only $20 more (for state residents) than the price of an individual hunting or fishing license. Fish are biting, doves are coming, so don’t miss out. It’s time to enjoy the “Best of Both Worlds.” Buy your combo hunt and fish license today. Visit https://www.azgfd.com/bestofbothworlds/.